Analysis: Nearly all of Wiliams' work came late in a blowout, so there is very little to take away from the fact that he split carries with Damien Williams evenly on the day. He should serve as a backup in the playoffs and should be in the running to retain a spot as a depth option again in 2019. 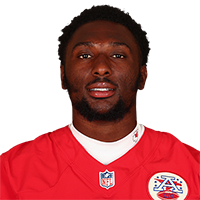 Analysis: He and Charcandrick West are thus in line to work in complementary roles behind Damien Williams on Sunday, with Spencer Ware (hamstring) inactive once again. Analysis: Williams made an abbreviated exit last Sunday at Seattle due to a hamstring injury. Although he proceeded to practice in full Wednesday through Friday, the Chiefs opted to place a "questionable" tag on the reserve running back. 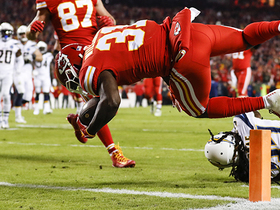 Spencer Ware (hamstring) is in the exact same boat as he attempts to return from a two-game absence. If Ware is active, he could take on the largest share of the work given to the backfield, leaving the Williamses (also, Damien) the occasional touch. Analysis: Williams injured his hamstring during Sunday's 38-31 loss to the Seahawks, leaving Damien Williams and Charcandrick West as the only options at running back. With Spencer Ware (hamstring) also managing a full practice to start the week, it appears the Chiefs will have a healthy backfield for the regular-season finale against the Raiders. The undrafted rookie out of LSU probably won't be a big piece of the equation unless there's garbage-time work in the fourth quarter. Analysis: The Chiefs' running back depth will be further taxed in the event Williams is unable to return, as that leaves Damien Williams and Charcandrick West as the only two healthy backs active for Sunday's game. Williams rushed twice for 13 yards and caught two passes for 19 yards and a touchdown against the Chargers on Thursday. Analysis: Williams occasionally spelled Damien Williams in the contest, though he saw just 15 snaps compared to the latter's 44. The rookie back could remain part of the mix if Spencer Ware (hamstring) is unable to take the field against the Seahawks in Week 16. Williams saw two offensive snaps Sunday against the Ravens, though he did catch a pass for eight yards. Analysis: Williams currently sits third on the depth chart behind Spencer Ware and Damien Williams, though the reacquisition of long-time Chiefs back Charcandrick West could threaten his job security to an extent. Regardless, Williams serves mainly as a special teams contributor and a depth back option at this point. Los Angeles Chargers cornerback Desmond King stops Kansas City Chiefs run plays. Kansas City Chiefs running back Darrel Williams catches for a 11-yard touchdown from quarterback Patrick Mahomes.